When the Rockefeller Center Christmas tree was lit last week, it represented "Christmas in New York" for millions of television viewers around the country. In the popular imagination, the Norway Spruce's 85-foot height, 45,000 lights and nine-and-a-half-foot crystal star symbolize the city's holiday sparkle and pageantry more than any other seasonal display. 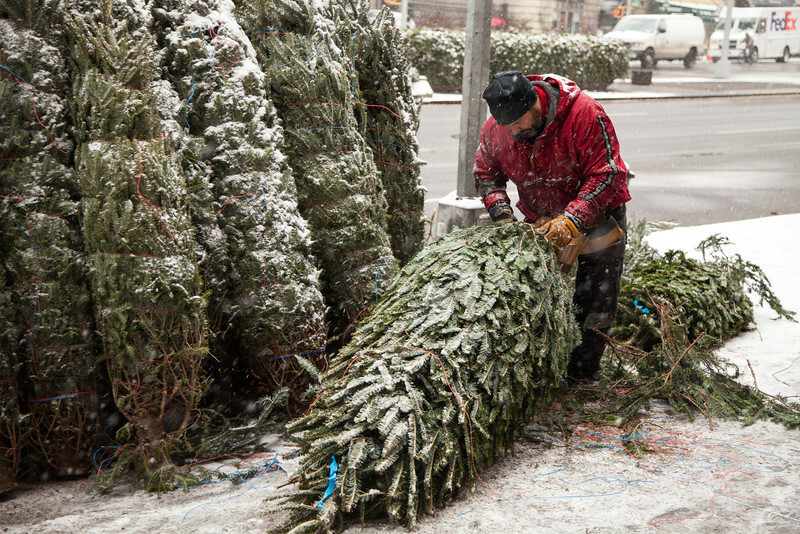 But for many New Yorkers, the real holiday experience happens locally at street level, as hundreds of intrepid men and women from Quebec, Vermont, Maine, Missouri and even Europe return annually to sell Christmas trees on the sidewalks and transform the city into a string of Santa's villages. The sellers are the modern-day incarnation of a New York tradition that predates the Rockefeller Center Christmas tree by nearly a century. In December 1851, Mark Carr chopped down three-dozen trees on his Catskill Mountain farm, transported them by horse-drawn cart to the city and set up a Christmas tree stand at the old Washington Market in Lower Manhattan. Carr's inventory sold out quickly, beginning the custom of people buying Christmas trees in the city and establishing him as the country's first Tree Man. Today's Tree Men and Women endure a month-long migrants' existence out of their parked vans, overcoming the physical hardships of exposure to the elements, grueling labor, irregular sleep, occasional bathing and too much takeout food as they form bonds with their customers and become integral holiday fixtures in their adopted neighborhoods. Francois, a married father of four who has been the Tree Man at his stand on Broadway and 102nd Street for a decade, embodies the authentic New York Christmas. He's a garrulous charmer chewing on an unlit tiparillo, with a salt-and-pepper beard, sap-stained red coat and serious boots, arriving the weekend before Thanksgiving to resume his role as the pivotal figure in a seasonal family of workers, customers and merchants. Francois sells Blue Spruces, Balsam, Frasier and Douglas Firs to his devoted clientele - a socioeconomic mix of Christians, Jews, Muslims, Agnostics and Atheists, families and singletons - who bring him home-cooked food, survival supplies and Christmas presents, but mostly come to his stand to talk. "People tell me things about their lives they wouldn't tell someone else," he says. "They trust me, because I'm a stranger." Over the years, Francois has become a surrogate father to Jason and Nelson, two neighborhood kids who work as his deliverymen and assistants. The makeshift world of Francois' timber-and-plastic-sheeted stand provides them shelter, purpose, engagement, identity and income that are harder to come by during the 11 months when Francois is gone. Angel, the night watchman who keeps the stand secure in the solitariness of the dark, shares with Francois the responsibility of providing for his own four children. Likewise, Jill, a Holocaust survivor who lives nearby, has become a surrogate mother to Francois. She opens her apartment for him to shower, do his laundry and enjoy a few minutes out of the cold. Jill never considered having a Christmas tree until she befriended this traveler from the north. These relationships tell the story of an undiscovered urban culture, where the season's rituals give meaning to the modern understanding of community, a spirit far removed from the glitz of Rockefeller Center. The tree, pagan in its origins, is secularized for these habitués and converts, but only a Scrooge would call this a War on Christmas. Francois' customers stop by the stand frequently until his departure on Christmas morning, well after they've purchased their tree or wreath. Anthony, a loyalist who moved from the Upper West Side to Queens last year, now drives in to buy his tree from Francois and honor their holiday rite. Standing under colored lights strung across the cluttered stand, Anthony pinpoints what Christmas in New York means to him and so many like him: "Over the years, Francois has become a really good friend. This has nothing to do with the tree anymore."